Treating inflammation and itching due to certain skin conditions. 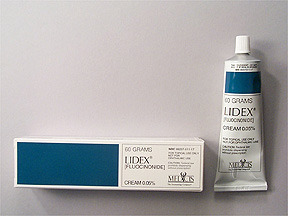 Lidex Cream is a topical adrenocortical steroid. It works by reducing skin inflammation (redness, swelling, itching, and irritation) by a way that is not clearly understood. Fluocinonide is a topical (for the skin) steroid. It reduces the actions of chemicals in the body that cause inflammation, redness, and swelling. Fluocinonide topical is used to treat the inflammation and itching caused by a number of skin conditions such as allergic reactions, eczema, and psoriasis. Lidex is a topical steroid prescribed to relieve chronic skin conditions including eczema. Like other prescribed steroid creams, it may be too harsh for people with sensitive skin or prone to allergic skin reactions. Even though prescription strength is recommended for severe cases, the side effects can be more troublesome than the actual skin condition. Side effects may include occasional burning, dryness, and redness. Caution is advised when using Lidex on children since they can absorb steroids at a higher level into their bodies.